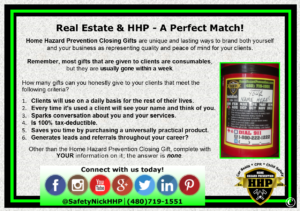 Real Estate and HHP – A Perfect Match! I have often heard that Real Estate Professionals spends up to 50% of their commission on advertising and attempting to get more business. I personally think that number is absurd, but I also do not work directly in that field. But HHP can offer several services and ideas that may help reduce that enormous expense by way of repeat and referral business, thus saving thousands of dollars a year. One way to help distinguish yourself from the thousands of other Real Estate Professionals is to offer additional services. This may be common sense, but sometimes it takes a little extra planning and some outside of the box thinking. One thing that we recommend you offer is a short course in Advance Planning, or Medical Directives. This can even be done by you, their trusted professional! Home Safety Programs teach all aspects of safety. Purchasing a home is often the largest and most difficult expense that a person may make. This is a good time for you to show your true colors, explain to them the benefits of purchasing their dream home; and also go one step further and offer to set up a short meeting with the professionals about advance planning. This field can easily get confusing, so I’d leave that to the professionals. But a good starting point to direct (or print off ahead of time) your clients to my web page. This link will take you to the section about Advance Planning and most of the steps that are required for someone to set up their final wishes. Advance planning is also known as a Healthcare Directive, and all of the information comes directly for the Arizona Governor’s Office. This can be a scary process that most people of any age group has not yet considered. But by presenting this in a professional, calm and helpful manner, you should be able to gain more trust and then gain more referrals and repeat business. All of this from a few simple printable PDFs that are free on our website. 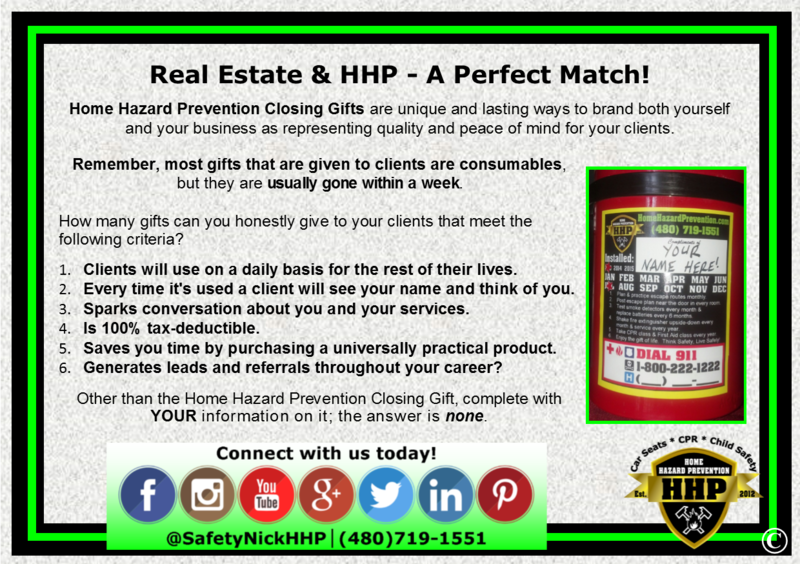 Be sure to contact Home Hazard Prevention with any of your personal or family safety needs. Remember, a complete safety program does not have to be expensive or time-consuming; and we can help with that. 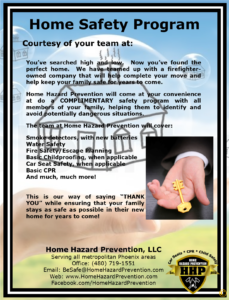 As a group of professional firefighters, there is no one more qualified than us to help keep your family safe!